Wakefield's Bill Tupou has been selected in the 2018 Dream Team. Wakefield Trinity stars Bill Tupou, Tom Johnstone and Matty Ashurst have all been named in the 2018 Super League Dream Team. The trio have been regular figures in the Trinity side that secured a fifth-place finish for the second-consecutive season. Tom Johnstone scored 24 tries in 23 Super League games. Tupou did not miss a single Super League game for Wakefield this year, scoring 14 tries in 30 appearances. The centre had been tipped for a place in the Dream Team by his coach Chris Chester a number of weeks ago. The 28-year-old was the top metre maker in Super League with an astonishing 4114 metres. "I am very happy, especially with the form I have had this year," said Tupou. Matty Ashurst has made over 1000 tackles in 2018. "I am happy that I get to share this day with a couple of teammates and it shows that the club has gone well this last couple of years. "From playing in the Million Pound Game a few years ago, to finishing fifth twice in a row. "The next step is to get a spot in that top four and compete for the number one spot." Teammate Johnstone finished second in the try-scoring charts with 24 in 23 games. The full 2018 Super League Dream Team. He was four scores behind St Helens full-back Ben Barba who crossed 28 times in 25 appearances. 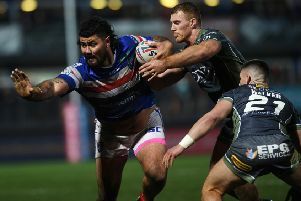 The 23-year-old was a constant threat on the wing for Trinity, highlighted by his 42 clean breaks, the most of any player in Super League this season. Ashurst has missed just one Super League game for Wakefield this year, making 29 appearances for Chris Chester's side. The 28-year-old has made an incredible 1058 tackles as well as making 216 marker tackles. Trinity's total of three players is the second most from a single club with 2018 League Leaders St Helens leading the way with seven players included. Second-placed Wigan saw two of their players picked while Challenge Cup winners Catalans Dragons had one man named in the 13. 2018 Dream Team: Barba, Makinson, Percival (St Helens), TUPOU, JOHNSTONE (Wakefield), Lomax, Richardson, Thompson, Roby (St Helens), Casty (Catalans), ASHURST (Wakefield), Bateman, O'Loughlin (Wigan).